Essential Ornithology provides the reader with a concise but comprehensive introduction to the biology of birds, one of the most widely studied taxonomic groups. The book starts with the controversial question of the dinosaur origins of birds and their subsequent evolution. Development, anatomy, and physiology are then discussed followed by chapters devoted to avian reproduction, migration, ecology, and conservation. 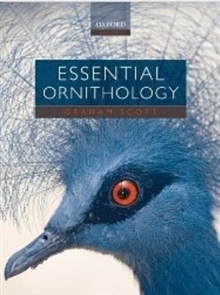 Sections dealing with aspects of bird/human relationships and bird conservation give the book an applied context. Drawing extensively upon the wider scientific literature, this engaging text places the results of classical studies of avian biology alongside the most recent scientific breakthroughs. Useful case studies are presented in a concise and engaging style with the student reader foremost in mind. Key points are highlighted and suggestions for guided reading and key references are included throughout.